Atlanta-based National Parking merges with Athens’ Prestige Parking Inc.
ATHENS, GEORGIA – National Parking is proud to announce that the company has completed a successful merger with Athens-based Prestige Parking, Inc.
With the 2016 college football season underway, Georgia Bulldogs fans – as well as UGA students and alumni – are excited about their future in the Classic City. 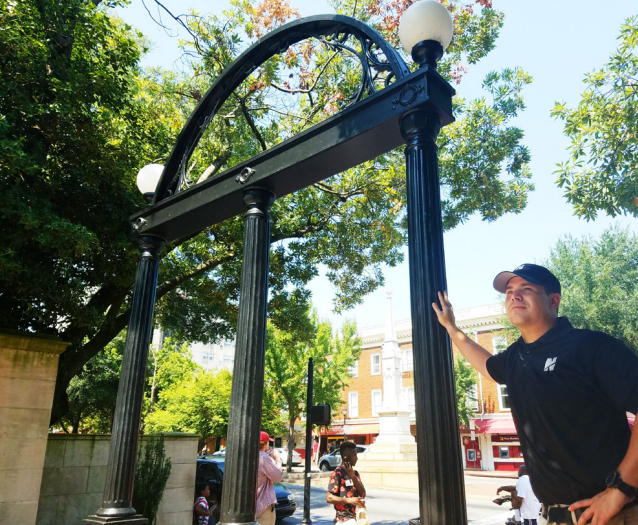 A new head football coach and a new team have arrived to exacerbate the ever-present parking headache in Athens. The recent merger between Athens-based Prestige Parking and Atlanta-based National Parking (National) will pave the way for improved parking in Athens for UGA fans. Utilizing a new permit management system, Parkmobile, and a new team of veterans, National promises to simplify game-day, semester, and daily parking for the Red & Black community, while still maintaining the personalized hometown service that Prestige Parking customers have become accustomed to during the past 20 years. Mariah Pierce remains as president of National Athens and will continue to assist with day-to-day operations. “Our commitment to our clients and the community is what drove this new partnership,” she said. Parking in Athens is progressing to keep pace with the growth of the city. The need for functional and convenient parking near UGA will only continue to increase. Expansion of existing parking services and the addition of new game day parking solutions are essential to the long-term development of the Classic City. National Athens will undoubtedly make a positive impact on the future success of parking in Athens. Go Dawgs!